Acme Adapters is the place that gives you everything you need to know in order to make a Suzuki Samurai Turbo Diesel or a Suzuki Sidekick Turbo Diesel using any Volkswagen 4-cylinder water cooled family of engines. That means you can swap any 4 cylinder VW engine from a Rabbit, Passat, Golf, even a quantum or newer bug into your Suzuki Samurai, Sidekick or Geo Tracker! ACME also manufactures a Toyota transmisson adapter, so you can have a 22R style transmission in your Suzuki. That also means Toyota pick-up owners can install a 1.9 TD/TDI diesel engine in a Toyota pick-up truck! Our goal is to provide products of integrity, generate good and accurate diesel conversion information, and to serve those that want a successful Suzuki VW turbo diesel conversion. Should you have a question or require further clarification about any of our diesel conversion products, feel free to E-mail us for more information. We will get back to you within 24 hours. Thank you for your interest. Happy swapping! it represents the wise choice of many alternatives." over a log and up a muddy embankment with wheels left spinning. Erik's wife demonstrates how it's done Alaska style! (3.5 minutes. 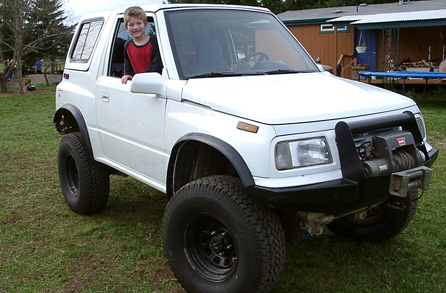 Click here for another good reason to have a DIESEL in your Suzuki!